Most Americans think of activism primarily in the context of and petitioning our elected representatives. It’s true that elected officials do have an important influence on the development of policies and programs that affect the lives of Americans—issues like immigration, reproductive rights, gun violence, mass incarceration, sexual harassment, and the opioid crisis are front and center in November’s election. The reality, however, is that activism and advocacy is a constant, ongoing process carried out by individuals, organizations, and professionals often far outside of Washington, D.C. Similar to its pervasive influence in other spheres in our life, technology has changed the nature of activism in our world. Looking at the innovations in digital activism provides a lens in the nature of change beyond what we see at the polling booth. We live in times that challenge our commitment to a just and fair society. The media presents a picture of our country characterized by inequality, violence, and hatred. It’s important to remember, though, that this is not new—people have faced these situations for centuries and have found ways to fight back. Community organizing, public interest lobbying, political action committees, legal advocacy and political fundraising have long been traditional tools of the public interest community. These methods helped create the eight-hour work day, children’s rights, social security, and a host of progressive legislation. The development of the global information economy, however, has created new threats while also posing challenges for these traditional techniques. Local community organizing models are less useful in a world of international corporations. Technology allows local activists to broaden their reach to a global stage. Technology that supports advocacy revolves around four functions: issue research, educating the public, recruiting and organizing, and applying power to decision makers. Many of the earliest technologies, such as e-mail and discussion lists, are still heavily used and address all of these functions. Newer technologies, such as social media, open street maps, and GitHub—while designed for other purposes have also been used to meet these traditional aims of activism. This has meant identifying a set of practices that go along with using a certain technology in a new context which can often be more difficult it would first appear. Probably the most significant development that is being deployed for activism lies in the data revolution and the vast quantities of information about people, and problems that’s being collected. Government data is supplemented by private corporate data released through corporate data philanthropy and data Collaboratives; there is also a large amount information available from a variety of sensors and other data collection systems. While there are serious concerns about the reach of data gathering and the decline of privacy, there is also a good deal of potential benefit that can come from the data revolution. Technology and public interest have grown from small beginnings to a place of major impact. The future promises a wealth of new and exciting possibilities. Many of the limitations that plagued activists for generations are addressed by tools that allow a movement to reach more potential supporters more quickly and at lower costs. Technology can also change the way that government operates by infusing the voice of the citizen into the corridors of power. More importantly, it is beginning to provide a way for everyday people to work for the issues that are important for them—it reminds us all that individuals have as much power as elected officials, and we can all work towards change every day, not just this 6 November. Featured Image: Two iPhones neon city sign by Seth Doyle on Unsplash. John G. McNutt, PhD, is Professor, School of Public Policy and Administration, University of Delaware. He is a specialist in the application of high technology to political and social engagement. He is currently working the application of data science to political action. 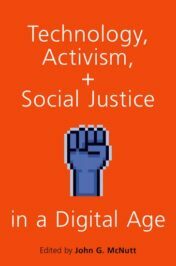 He is the author of Technology, Activism, and Social Justice in a Digital Age published by Oxford University Press in August.